The carry strap around your neck and the monitor in front of your chest, one hand guides the camera cable, the other precisely controls the pan and tilt camera head via the typical Wohler keypad: That is how stable the new Wohler VIS 400 Video Inspection Camera is and how easy it is to work with while standing on steep roofs inspecting chimneys or during pipeline and sewer inspections. 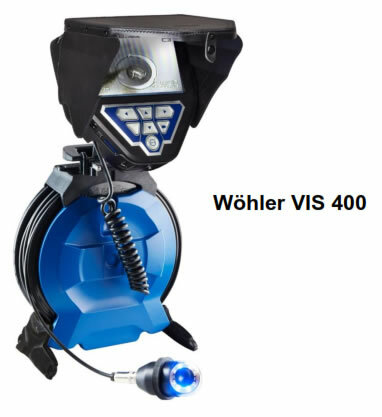 From chimney sweeps to plumbers, the Wohler VIS 400 is a must have when it comes to video inspection equipment. Put your camera system together to suit your requirements and wishes. Integrated video output – simply record and store photos, videos and voice annotations on a 2 GB SD card for documentation and archiving purposes for you and your customers.